As you use LinkedIn, you should notice that the system often prompts you to endorse your contacts for specific skills on their profile. 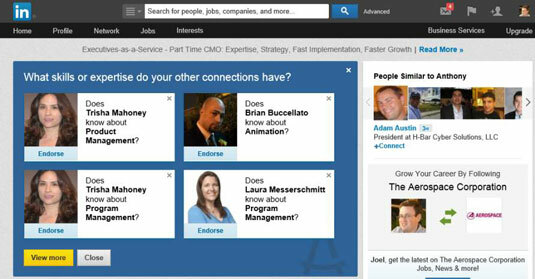 LinkedIn built this into its system to make it as easy and automatic as possible to endorse your contacts without you looking for a particular screen or function. If offered, you can click the Endorse All 4 button to endorse all four contacts at once. In some cases, you can click the View More button to see a new screen of four contacts with a skill to endorse for each one. You can click individual Endorse links (below each profile picture) toselect which of the four endorsements you want to give. Each time you click Endorse, a new skill and contact pops up in that box for you to consider. You can click the X in the top right corner of each box to close that option. That box is repopulated with a new contact and a new skill to endorse for that contact. You can click the Close button (the X in the top right corner of the big blue box) to stop the process. When you are looking at any particular contact’s profile, you may be presented with a blue box asking you to endorse multiple skills for that contact. You can also bring up this box by clicking the drop-down arrow next to the Send a Message button and selecting Endorse Skills & Expertise. You can click the yellow Endorse button to endorse all the skills listed in the box. To remove an individual skill from the list before clicking Endorse, click the X next to the skill name. 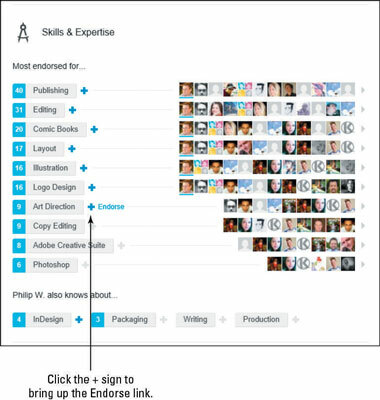 To add an individual skill to the list before clicking Endorse, simply start typing in the Type another area of expertise area. 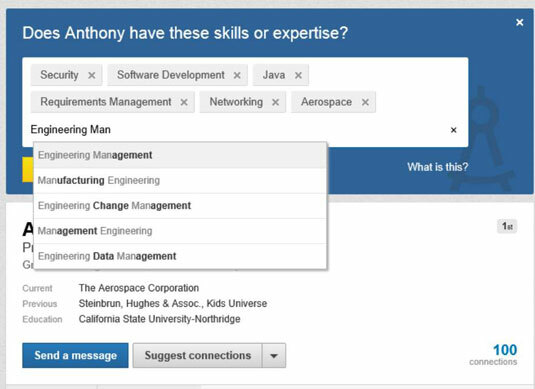 LinkedIn prompts you with possible skill names that you can click, or finish typing to add that skill to the list. You can click the Skip button (or the X in the top right corner of the blue box) to stop the process. The box disappears and you see the contact’s profile page. After you click Endorse or Skip, the process is concluded for that particular contact. When you visit another contact’s profile page, the process begins again for that contact. Think carefully about which skills you can honestly endorse for another person, as you should only endorse skills you truly believe the other person has or that you have witnessed in action. You may also want to consider what skills the other person wants highlighted on her profile, which can be evident from the most endorsed skills she has currently. If you want to give endorsements for someone’s skills without being prompted, simply go to her profile page and scroll down to her Skills & Expertise section, where you can see her identified skills. When you see an individual skill you want to endorse, hover your mouse over the + sign next to the skill name and click the Endorse link that appears. Any skills you have already endorsed appear with a blue filled in + sign next to the skill name, and your profile picture is underlined to the right of the skill name. If you want to remove a particular endorsement, hover your mouse over that blue + sign and click the Remove Endorsement link that appears. 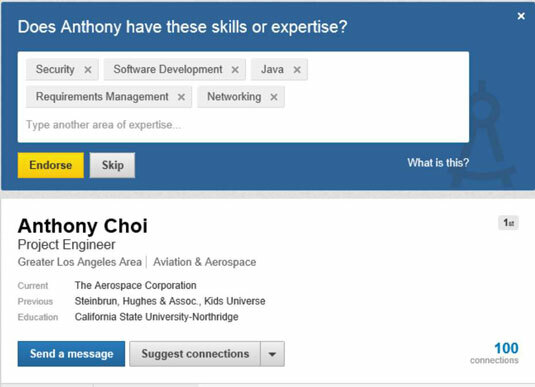 You can always go back and add more skill endorsements at any time, even after you initially endorse someone’s skills.